When I was asked to make this cake, I had no idea what NINJAGO was. 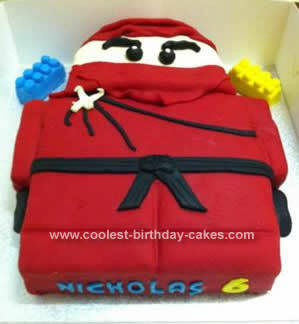 The mum asked me for a Lego Ninjago Birthday Cake, so I searched online for some ideas. I had some figurines so I was planning to bake a rectangle cake and decorate it with fondant and the plastic figurines. I baked my cake and as it was cooking I noticed a TV ad with NINJAGO and I decided this was the cake I was going to make. I baked an additional cake so that I could carve the head out of. The body of the cake was a chocolate cake with vanilla ganache through the centre and all over and the head was a vanilla cake with chocolate ganache through the centre and all over. I then rolled out fondant and covered it and decorated it. For the two lego pieces, I used LCM bars and covered them in fondant and used mini marshmallows covered in fondant for the top of the lego. The mum and child loved the cake as did all the guests. It not only looked great, it tasted sensational and was very moist.